At the end of the last ice age, a population of polar bears was stranded by the receding ice on a few islands in southeastern Alaska. Male brown bears swam across to the islands from the Alaskan mainland and mated with female polar bears, eventually transforming the polar bear population into brown bears. Evidence for this surprising scenario emerged from a new genetic study of polar bears and brown bears led by researchers at the University of California (UC), Santa Cruz. The findings,published on March 14, 2013 in the open-access journal PLOS Genetics, upend prevailing ideas about the evolutionary history of the two species, which are closely related and known to produce fertile hybrids. Previous studies suggested that past hybridization had resulted in all polar bears having genes that came from brown bears. 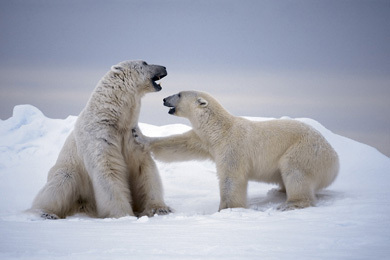 But the new study indicates that episodes of gene flow between the two species occurred only in isolated populations and did not affect the larger polar bear population, which remains free of brown bear genes. At the center of the confusion is a population of brown bears that lives on Alaska's Admiralty, Baranof, and Chicagof Islands, known as the ABC Islands. These bears--clearly brown bears in appearance and behavior--have striking genetic similarities to polar bears. "This population of brown bears stood out as being really weird genetically, and there's been a long controversy about their relationship to polar bears. We can now explain it, and instead of the convoluted history some have proposed, it's a very simple story," said coauthor Dr. Beth Shapiro, associate professor of ecology and evolutionary biology at the UC Santa Cruz (UCSC). Dr. Shapiro and her colleagues analyzed genome-wide DNA sequence data from seven polar bears, an ABC Islands brown bear, a mainland Alaskan brown bear, and a black bear.